According to Barack Obama, “We’ve created 4.3 million new jobs over the last 27 months, over 800,000 just this year alone. The private sector is doing fine.” But what he failed to mention is what any American paying attention already knows, that we lost 5.0 million jobs during the first 14 months of his 41-month term. Using simple math, it doesn’t take much for any American to figure out that Mr. Obama has been in office for a total of 41 months. Curiosity leads us to believe that there must be some reason Mr. Obama isn’t saying anything about his first 14 months in office. So here’s what we found. By the time Mr. Obama reached the White House, the private sector had already lost 3.7 million jobs to the Great Recession. 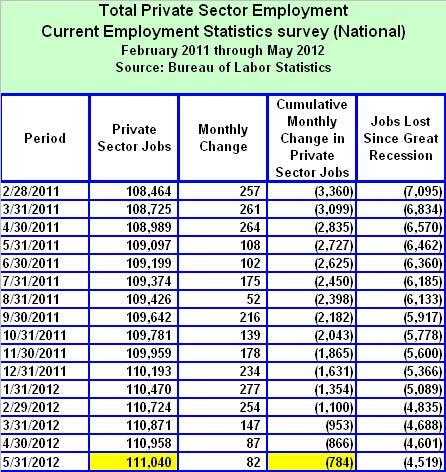 Then between January of 2009 and February of 2010, his first 14 months in office, another 5.0 million jobs were lost. And finally, over the last 27 months, 4.3 million jobs were either created or saved. Once again simple math leads us to the conclusion that the private sector is worse off today than before Mr. Obama was sworn in, by roughly 700,000 jobs. Over George W. Bush’s eight-year term, the economy went through two recessions. The first was much shorter than the second, lasting only nine months, from March of 2001 to November of 2001. But the Great Recession lasted for a period of 19 months, commencing in December of 2007 and not ending until June of 2009, six months into Mr. Obama’s term. However, in the month after the Great Recession began, the number of private sector jobs reached an all-time record high of 115,647,000. 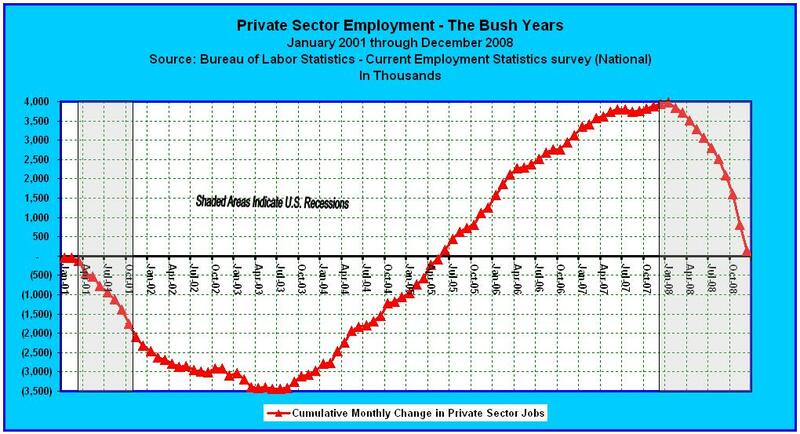 In fact, when we summed together all private sector employment gains and losses during Mr. Bush’s time in office, it resulted in a net gain of 3,970,000 jobs through January of 2008. But once the recession heated up, from its beginning until the baton was passed to Barack Obama in January of 2009, a total of 3,735,000 of this net gain had been wiped out. As a result, the number of net jobs gained during the Bush presidency was a paltry 147,000 (see chart above, and table below). In January of 2009, Barack Obama stepped in to rescue us from the disaster of 2008. His stimulus plan was passed by both houses of Congress on February 14, 2009. At the time, Mr. Obama delivered the following statement. “Congress has passed my economic recovery plan – an ambitious plan at a time we badly need it. It will save or create more than 3.5 million jobs over the next two years, ignite spending by business and consumers alike, and lay a new foundation for our lasting economic growth and prosperity.” But the promises he made on that day would soon come back to bite him. Obama’s economic team calculated that without the stimulus plan, the economy would lose another 1,613,000 jobs over the ensuing two-year period. But with passage of the stimulus bill, they claimed that not only would those 1,613,000 jobs be saved, but an additional 1,887,000 would be created, all by January of 2011. But as you can see in the table below, Mr. Obama’s economic team was way off the mark. 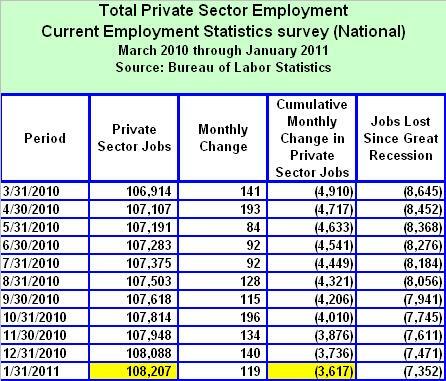 By February of 2010, just one year later, an additional 5,051,000 private sector jobs were lost. This brought the total number of jobs lost from the beginning of the Great Recession to 8,786,000. Fortunately, this turned out to be the end of the decline. By January of 2011 it was time to tally the results of Mr. Obama’s $831 billion stimulus plan. As the next table reveals, instead of saving 1,613,000 jobs and creating another 1,887,000, from the beginning of his term through January of 2011 the private sector had instead lost a net total of 3,617,000 jobs. This brought the total number of private sector jobs lost since the beginning of the Great Recession to 7,352,000. Since the recession had already wiped out 3,735,000 private sector jobs before Mr. Obama came along, if his plan had worked as promised, then the number of jobs lost to the recession should have been reduced to 1,848,000 by January of 2011. But instead this number rose to 7,352,000. In other words, if 1,613,000 jobs were expected to be lost and saved over his first 25 months, then there should not have been any losses at all. 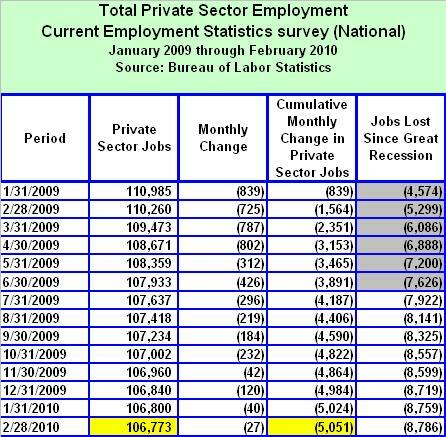 And since we were already 3,735,000 jobs in the red before Mr. Obama’s time, if the private sector had created 1.887,000 jobs as promised, then by his 25th month we should have only been off target by 1,848,000 jobs (3,735,000 minus 1,887,000). Thus, the stimulus plan failed miserably. When Barack Obama was sworn in, he inherited an economy that was 3,735,000 jobs in the hole, but after two years of his policies, and $831 billion tax dollars squandered on his stimulus plan, the private sector lost an additional 3,617,000 jobs. Skipping ahead to May of 2012, we find that since the time of Mr. Obama’s inauguration, the private sector has lost a total of 784,000 private sector jobs, for an average loss of 19,122 jobs per month. This is in addition to the 3,735,000 lost under Mr. Bush, for a cumulative loss of 4,519,000 jobs since the beginning of the Great Recession (see table below). In other words, the private sector is worse off today than it was on the day Barack Obama was sworn into office. And if you will, not only is the private sector worse off than it was three years and five months ago, the Federal government has taken on an additional $5.3 trillion in debt just to get us where we are – nowhere. 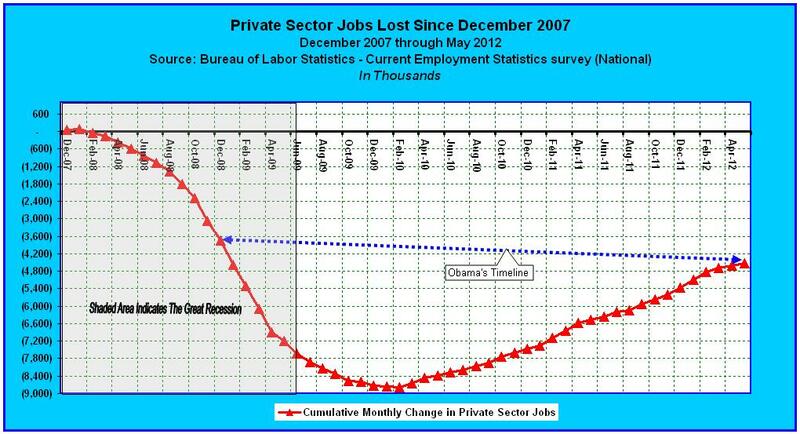 The total number of private sector jobs lost, since the beginning of the Great Recession, is shown graphically in the chart below. In spite of his repetitious rhetoric, and no matter how many times he boasts that his policies have “created 4.3 million private sector jobs over the last 27 months,” the truth is that not one private sector job has been created since the beginning of Barack Obama’s 41-month term. The Bottom Line: No one likes to discuss Mr. Obama’s initial 14 months in office, but it will nevertheless go down in history as a part of his record. The truth is that over his first 14 months the private sector lost 5,051,000 jobs. Then during his last 27 months it recovered 4,267,000 of the jobs lost during his first 14 months. So it was only after suffering far worse job losses under the influence of Mr. Obama than we started with, that the private sector was able to recover 4,267,000 of the 5,051,000 jobs lost during his 41-month term. So where is the private sector today? We are still down by the same 3,735,000 jobs lost to the Great Recession before Mr. Obama arrived, plus an additional 784,000 lost during his 41-month term to-date. Yet, Mr. Obama seems to think that the private sector is doing fine, and that for some reason he deserves a second shot. Sorry pal, but we don’t have another $5.3 trillion to throw away. That’s the end of Part 1, but it’s not the end of the story. In Part 2 we’ll tack on the total number of Government sector jobs, Federal, State and Local, lost over Mr. Obama’s 41-month term. Then we’ll discuss how the 8.2 million person increase in the Working-Age Population, during Mr. Obama’s term, has made the real employment situation far worse than it appears to a casual observer. 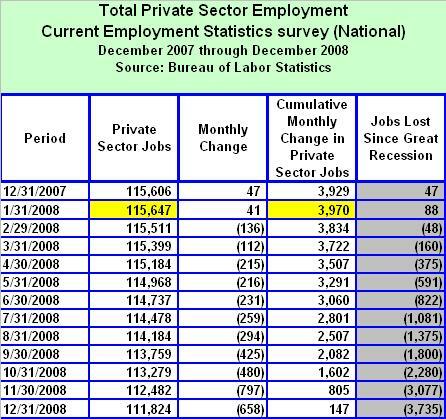 Note: Some economists and pundits will attribute the 839,000 jobs lost in January of 2009, Mr. Obama’s first month in office, to Mr. Bush. If you insist on doing so, then that would mean that the total number of private sector jobs gained over Mr. Obama’s 40-month term would be 55,000 (i.e. 839,000 minus 784,000). However, the number of jobs lost since the beginning of the Great Recession is unchanged, at 4,519,000. But before you start boasting about how Barack Obama added 55,000 private sector jobs over his 40-month term, you might want to consider whether a job creation record averaging just 1,375 jobs per month is worth the effort. ← The Private Sector is NOT Doing Fine | How’s the Federal Government Doing? Excellent post as always. I find it troubling how many Leftist blogs are showing the lack of Public sector employment as a reason why the economy is in the tank and they compare this to the previous three recessions. They always leave off the Private sector employment graphs and they do that on purpose. If the Private sector hasn't rebounded then local and state tax revenues are suffering (less people paying taxes) and of course the public sector employment will be lower. Lower public sector employment is a symptom of the failed Keynesian policies.